Lifelinemobile.com is a leader in providing mobile health services. One of their services is a mobile mammography service. Mammograms are the first line of defense against breast cancer. Routine mammograms are important as a diagnostic tool for finding breast cancer at the early stages and treating it. Lifelinemobile.com mobile mammography makes having a mammogram more convenient and increases the chance that breast cancer will be caught in the early stages and that many lives will be saved. 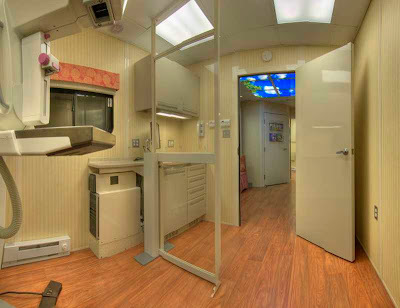 Lifelinemobile.com mobile mammography suites are tough mobile units that are specifically designed to safely and privately process mammograms while being mobile. Each of the mobile units can be fitted with the equipment of the physician's choice. Lifelinemobile.com built the first mobile mammography unit, and is the expert in the field, creating sturdy products. The units themselves are constructed to be very strong and protect the equipment inside. Measuring 40 feet long, each unit has plenty of room for patients to wait in comfort and staff to do their jobs well. There is room for 11 patients, so no one should ever have to wait outside for their appointment. Most importantly, Lifelinemobile.com offers excellent customer service and will help its customers design exactly the mobile mammography unit to suit the needs of its patients.